“I am a mom of 2 little girls 11 and 8. When they were in Preschool, I bought some products from TYALT. 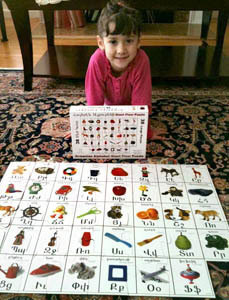 The Armenian Alphabet Puzzle was amazing. Both of my girls used to play with it. I had to buy 2 because when friends came over, they compete together on who will be assembling the puzzle alphabet faster. It helped both of them learn the Alphabet by practicing the words… As to The Poster, I did frame it and hung it in their playroom. Visually looking at the letters while playing in the room, made them become familiarized with all the 36 letters. Until now, we use it sometimes when we do Armenian homework in Elementary classes. When my 8 yr old is confused about a letter (for example — which T or K to use), she runs back to the room and checks the poster. Find Our Products in Bookstores.